The photographic composite made from color images is combined with an image from the Extreme-ultraviolet Imaging Telescope (EIT) aboard the SOHO spacecraft. The EIT image is the ratio of images taken in two different spectral lines formed at different temperatures and so is a temperature map of the corona on the solar disk. It has been oriented similarly to the eclipse image by using the coronagraph (LASCO) images of the outer corona taken from SOHO. Comparing the eclipse and the EIT images allows you to see the regions on the solar disk where the coronal structure was formed and to trace it out into the corona seen at eclipse above the solar limb. Image processing by Wendy Carlos from photographs by Jay M. Pasachoff; © 1999 Jay M. Pasachoff and Wendy Carlos. All rights reserved. EIT image courtesy of the SOHO EIT Team, NASA Goddard Space Flight Center. More composite images processed by Wendy Carlos. A group of scientists and students from Williams College carried out experiments in Aruba principally designed to study the heating of the corona. Professor Jay M. Pasachoff, its leader, was at his 26th solar eclipse. Pasachoff is Field Memorial Professor of Astronomy and Director of the Hopkins Observatory at Williams College, Williamstown, Massachusetts. He is also Chair of the Working Group on Eclipses of the International Astronomical Union. His group spent nearly two weeks on site, setting up and aligning the equipment. Pasachoff's main experiment dealt with the still open question of how the corona, the outermost layer of the sun's atmosphere, reaches a temperature of 2 million degrees Celsius (about 4 million degrees Fahrenheit), even though the everyday surface of the sun below it is only 6,000 degrees Celsius (about 11,000 degrees Fahrenheit). Another experiment is in liaison with scientists in charge of an experiment on the Solar and Heliospheric Observatory (SOHO) spacecraft. The experiments are in collaboration with Dr. Bryce Babcock, staff physicist at Williams College. Pasachoff, together with Dr. Leon Golub of the Harvard-Smithsonian Center for Astrophysics in Cambridge, Massachusetts, recently completed the first textbook about the solar corona to be written in decades; it was published last summer. The first experiment was a search for rapid oscillations in the corona, with periods of about 1 second. Pasachoff has developed techniques over the last two decades to observe in the so-called "coronal green line," a color in which the corona emits light especially strongly, with time resolution so fast that such short periods can be detected. Oscillations with periods in that short range are predicted by some theories that hold that the extreme coronal heating is caused by vibrations of magnetic loops that make up the lower corona. Such loops of gas, held in place and shaped by the sun's magnetic field, have been observed, and the question is whether their vibrations bring enough energy into the corona to heat it sufficiently. Babcock and Williams College undergraduate Timothy McConnochie '98 concentrated on this experiment. A first look at the eclipse observations showed very strong signals recorded by the equipment. The experiment is supported by a grant from the Atmospheric Sciences Division of the National Science Foundation. Another experiment was to image the solar corona during the eclipse at the same scale and with the same green filter as a filter in the coronagraph experiment on board the Solar and Heliospheric Observatory (SOHO). This observation is in collaboration with Dr. Guenter Brueckner of the Naval Research Laboratory, principal investigator of that experiment, LASCO (Large Angle Spectrographic Coronagraph). The comparison of the eclipse image with an image taken with one of LASCO's coronagraphs will provide a calibration of how much light is scattered in the process of making an artificial eclipse on board the spacecraft. 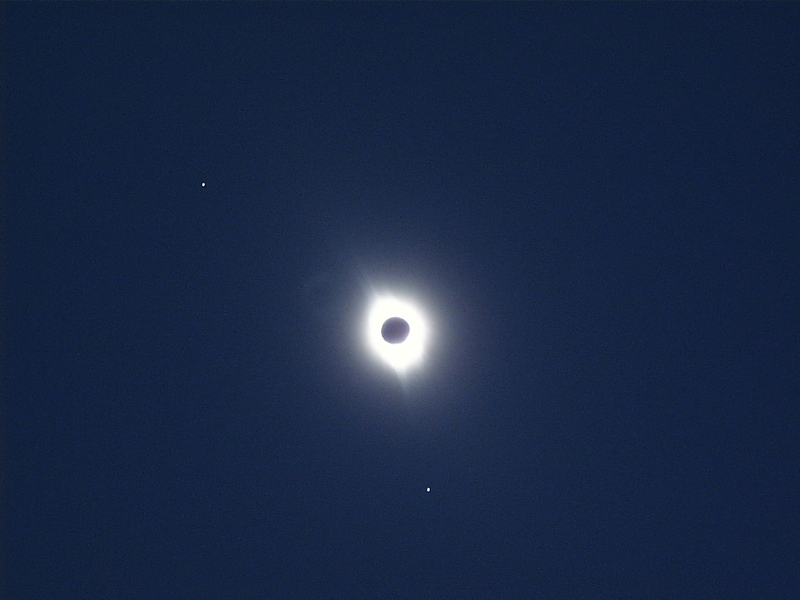 Such artificial eclipses cannot quite match the quality of a natural eclipse, in which the moon hides the sun's light before it reaches a telescope. Stephan Martin of Williams College supervised that experiment, which obtained 7 excellent images of the corona during totality. This experiment was supported in part by the Committee for Research and Exploration of the National Geographic Society. A composite image of our ground-based image with a SOHO image at the time of the eclipse is available. Another experiment was to map of the temperature of the corona, using a technique of comparing electronic images of the corona taken at special ultraviolet wavelengths. Following theoretical work, these wavelengths were chosen to include two such at which the difference between the shape of the everyday sun's spectrum and the corona's spectrum is especially striking. Unfortunately, a power failure shortly before the eclipse led to a loss of tracking of the sun, and the experiment will have to be repeated at the next eclipse to obtain data. Lee Hawkins of Wellesley College and the Keck Northeast Astronomy Consortium and Bryn Mawr College undergraduate Caroline Artacho concentrated on this experiment. The experiment is supported by a grant from the Committee for Research and Exploration of the National Geographic Society. Jonathan Kern of New Orleans made a coronal image through filter that was specially graded in density to adjust for the wide range of coronal intensities. This type of image shows coronal structures especially well. Kern also participated in the other experiments, and designed the optical path for the oscillation experiment. 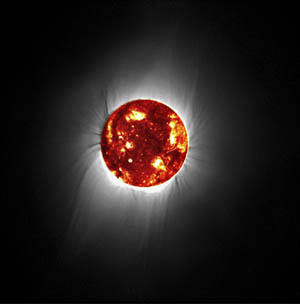 A digital image taken by Babcock was downloaded over the Internet to NASA soon after the eclipse, where it was combined with an image of the solar corona taken from SOHO's Exreme Ultraviolet Imaging Telescope (EIT) under the supervision of Dr. Joe Gurman of the NASA Goddard Space Flight Center. The combined image was released publicly by NASA just a few hours after the eclipse. The expedition also recorded a wide variety of coronal and other solar images in the visible and infrared parts of the spectrum, including images taken with lenses of 500, 600, and 1250 mm focal length and a Hi-8 video. Some of the visible-light images will be enhanced in collaboration with Wendy Carlos of New York. Also collaborating with the expedition were Dr. Robert Eather of Boston and John Weiley of Australia, who made an IMAX large-scale time-lapse movie of the eclipse. The developed film looks excellent. An unusual aspect of Pasachoff's experimental team was that it included so many undergraduate students, 8 in total. All the astrophysics majors at Williams College were included: Timothy McConnochie '98, Johan Kongsli '98, Mac Stocco '98, James Bates '98, Laura Brenneman '99, and Craig Westerland '99. They were supported by the NSF and National Geographic grants; by the Keck Northeast Astronomy Consortium, a group of 8 colleges whose astronomical student research is supported by the W. M. Keck Foundation; by the Safford Fund, set up by his descendents in honor of the second director of the Hopkins Observatory, Truman Henry Safford; and by the Brandi Fund. Also through the Keck grant, undergraduates Carolina Artacho Guerra of Bryn Mawr College and Lisa Reinker, currently an exchange student at Williams College from Wellesley College, participated in the expedition. Scientific staff included Pasachoff, Bryce Babcock, Physicist and Coordinator of the Bronfman Science Center of Williams College; Lee Hawkins, Instructor at Wellesley College; Stephan Martin, Instructor in Astronomy at Williams College; and Jonathan Kern, an optics designer from New Orleans. The main team spent two weeks on site in Aruba setting up, aligning, and testing the two tons of equipment they brought. They arrived in Aruba on February 15th. Winds at the site often gusted to more than 30 knots, and were measured with anemometers. The winds did not diminish during the eclipse, remaining in the 13-20 mph range. The temperature, though, dropped by about 10 degrees during totality. These measurements were carried out by Eric Plesko, one of several alumni and friends of Williams College who traveled to the eclipse in association with the expedition. Click here for expedition photos. 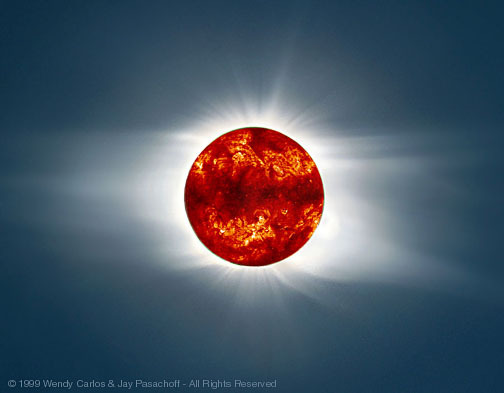 A composite image made from several individual eclipse photographs showing the shapes in the corona at the total solar eclipse of February 16, 1998. The shapes of equatorial streamers and of polar tufts are governed by the Sun's magnetic field. See below for other processed images and their use in liaison with the Solar and Heliospheric Spacecraft. Image processing by Wendy Carlos from photographs by Jay M. Pasachoff; © 1999 Jay M. Pasachoff and Wendy Carlos. All rights reserved. The images displayed below were taken with a Photometrics PM512 CCD through a 300mm telephoto lens in support of SOHO observations taken concurrently. The images above are the raw, unprocessed images. The images were processed during the summer of 1998 by Ben Knowles '99 of Vassar College as part of his Keck Summer Fellowship with Prof. Pasachoff at Williams College. By assembling the images of various exposures, 1 s to 64 s, detail came to be visible at a range of distances in the corona. The result is displayed below, surrounding with a SOHO EIT image. Since the eclipse data were taken with a CCD, they show relative intensity much more accurately than can be provided by film observations. The images were taken at a continuum green wavelength with a filter passband width and wavelength matching a filter on the LASCO C1 coronagraph on SOHO. The collaborative effort was worked out by Dr. Guenter Brueckner of Naval Research Laboratory, the LASCO PI, and Prof. Pasachoff. Ultimately, the eclipse images will be compared with the LASCO C1 image taken nearest to the eclipse. Support for these eclipse observations came from a grant to Prof. Pasachoff from the Committee for Research and Exploration of the National Geographic Society. A FITS version of the combined image is available here, and a logarithmically-scaled version of the same is available here. More composite images, processed by Wendy Carlos. Composite images of the 1998 and 1999 total eclipses, processed by Dan Seaton. Jonathan Kern's Newkirk camera images are also available. A quicktime movie (124 KB) is available which shows the partial phases of the eclipse and some corona images at the end. Eclipse (2.3 MB) shows the moon's shadow as it crosses the earth at over a thousand miles and hour. The larger shadow is the penumbra and the smaller one is the umbra. A total eclipse of the sun is visible only from locations within the umbra. People located within the penumbra will see a partial eclipse. Eclipse from moon (2.7 MB) shows the view of the eclipse from the surface of the moon (note that the size of the earth has been enlarged - it would appear much smaller from the moon). Notice how from the moon's point of view, the Earth passes through the moon's shadow. The price, including a diskette with a program to calculate local circumstances as well as mailing by registered surface book post, is ATS 1085.-; for air mail delivery, ATS 190.- should be added. Please send a check in ATS, payable to Astronomisches Bureau, Hasenwartgasse 32, A-1238 Vienna, Austria.